You may think your lock is difficult, but for us it’s easy – we’re experts. If you need immediate entry or have a digital, electronic or keyless entry lock that needs repair or replacement, give us a call. We’ll get to you fast and do the work right from our van, regardless of your make and model. With the best reviews of any locksmith in New York City, there is no doubt why the NYPD, FDNY and the New York City Sheriff use M&D Locks and Keys as well; all M&D technicians are fully licensed to work on your vehicle: Lic #1346389. Whether you have a key FOB, transponder key or keyless entry unit, M&D Locks and Keys will get to you and replace or repair your lock fast. We’ll quote you an honest price for honest work and will not damage your vehicle. Whether you need a high tech, remote access home security system or an old fashioned, heavy-duty Mul-T-Lock for your home, M&D Locks and Keys has got the answers. Call us first. Let us know what you need and if we don’t have the part, then we’ll tell you how to find it. 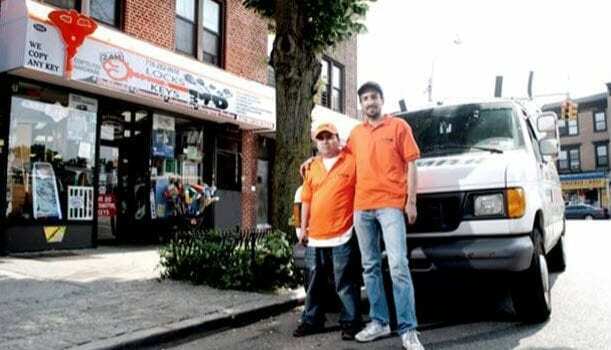 M&D has two shops in New York City and we service all 5 boroughs. We’ve got parts for security gates, window bars, impenetrable front doors and security garage doors. We’ll supply your home security cameras as well as your remote access and intercom system. Our shops even carry hardware supplies for your home. We have technicians in all areas of home, business and automotive security. give us a call or stop by either of our shops. M&D Locksmiths has a wide variety of the top brand locks for residential and commercial use at affordable prices. Our skilled and licensed Locksmiths are happy to consult with our customers with any questions and concerns. We have state of the art security lock systems with modern technology to ensure you maximum security and precise installation. With many years of experience in the locksmith industry we can assure you the most professional and qualified service. M&D’s Locksmiths are mobile and 24/7 to provide our customers with quality locks in Brooklyn, Manhattan, Queens, Bronx, Staten Island and Long Island. We carry the best brands for commercial and residential safes. Our product selection is, as always, the highest quality to suit your security needs. Our skilled technicians provide a periodic maintenance service to ensure top quality equipment. Place an order on any type of safe and we will be happy to provide you with the safe and installation. For many years now, our locksmith services also provides our customer with quality wooden doors, metal doors, aluminum doors, glass doors, interior and exterior doors. Our professionals will install the door/s of your choice as well as installing any lock, or security system. We sell, install and provide maintenance for any door of your choice. Call now to find out more about the selection of doors we carry and how we can help you pick the best door of your choice. We also carry and install a wide selection of various gates, from custom designed ironwork to standard gates. We provide quality and durable gates for your home, business or any other need. We also specialize in making custom gates with modern technology. We can handle any type of projects big or small. You choose the product that fits your specifications and our professional installers are always ready to handle the installation, as well as maintenance and repairs. With our years of experience in security systems we are able to advise our customers with the best type of intercom security system that will be suitable for your home or office. Don’t hesitate to call us and consult with our experts. We carry all the leading brands in intercom systems. When it comes to security, you can trust M&D to provide the best intercom and security systems available. We also carry card access control systems for your doors and gates. The card access control system is made with the highest technology and is very easy to control. With card access control security systems, all your security needs are met. Call today, for consultation to find the best product for you. We’ll take care of the rest. To learn more about M&D, check out our video on YouTube and see why so many New York residents and business owners trust M&D.